A diligent air ambulance pilot bought a parking ticket for his helicopter while attending reports of a stabbing in Norwich. A 1964 Ferrari 330GT is expected to make more than half a million pounds in a charity auction for the East Anglian Air Ambulance. The specially commissioned Nembo Spyder - with a 4 litre V12 - was owned by motor enthusiast and collector Richard Allen from Essex until he died on 26 November. He left the car to be to be auctioned off in memory of the time the ambulance came to the help of one of his fellow racing drivers after a crash. Previous auctions of the same car have seen sales of £660,000. The car will be auctioned H&H Classics at Duxford on March 29th. A man whose life was saved by a helicopter rescue team has thanked the paramedics who treated him. Edward Clitheroe who is 68 was hit by a car on the Fakenham to Holt road in November 2013. 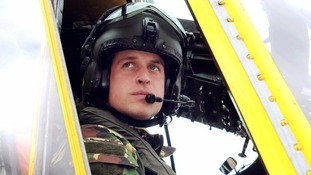 He was flown to Addenbrooke's hospital in Cambridge by the East Anglian Air Ambulance. A man who was badly injured after he went to help at the scene of a car crash in north Norfolk, has been reunited with the air ambulance crew who saved him. He spent 5 weeks unconscious in Addenbrooke's hospital in Cambridge. He had to have his left leg amputated below the knee. Today he met Dr Jenny Townsend who was the East Anglian Air Ambulance Doctor, who saved his life. A kite surfer who was badly injured when he hit the sea wall in Southend is to meet the paramedics who saved his life. Mark Warren hit the sea wall and was rescued by the East Anglian Air Ambulance. He will get the chance to say "thank you" in person.